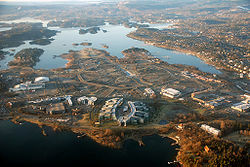 As of 2001, the Fornebu area is being developed as a centre for information technology and telecom industry, as well as there being some housing project developments nearby. The new headquarters of Norway's telecom giant Telenor are located in the area. The name (Norse Fornabú(ð)) originally belonged to an old farm on the peninsula. The first element is the genitive form of an old male name Forni, the last element is bú n 'farm' (or maybe búð f 'shed, simple house'). Scandinavian Airlines System's Norway offices are in Fornebu. Norwegian Air Shuttle, Telenor, Aker Kværner, Statoil, Norgesgruppen and EVRY are also based at Fornebu. Partnair, a charter airline, was headquartered at Fornebu Airport up to 1989. When the airline Busy Bee of Norway existed, its head office was on the grounds of Fornebu Airport. Braathens and SAS Braathens had their head office facilities in a building on the grounds of Fornebu Airport. 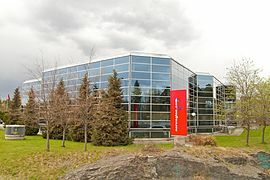 In 2010 Norwegian Air Shuttle bought the former Braathens head office. ^ Telenor press release "Telenor’s new headquarters to open on September 23", September 22, 2002. ^ "SAS head office in Norway." Scandinavian Airlines System. Retrieved on 8 June 2009. "SAS Head Office NO-1330 Fornebu"
^ "Norwegian Air Shuttle contact details." Retrieved on 15 November 2009. ^ "World Airline Directory." Flight International. 26 March 1988. 102. ^ "World Airline Directory." Flight International. 27 March-2 April 1991. 78. ^ Henriksen, Øyvind. "Kjos kjøper Braathensbygget Archived 2010-02-27 at the Wayback Machine." E24. 24 February 2010. Retrieved on 24 February 2010. "Norwegian-sjef Bjørn Kjos kjøper det tidligere hovedkvarteret til Braathens og SAS Norge. Nå skal Norwegian flytte inn i bygningen" and "Oksenøyveien 3 på Fornebu utenfor Oslo er kjøpt av Bjørn Kjos og Bjørn Kise." Wikimedia Commons has media related to Fornebu. This page was last edited on 5 December 2017, at 04:16 (UTC).